Florida Spyce is a unique blend of coastal fragrances combined with soft oils. The refreshing scent of the cologne and soap is derived from an age old formula used by sailing captains, plantation owners and travelers to sooth the skin and provide refreshment. Made on the Gulf Coast of Florida. Florida Spyce is a unique blend of coastal fragrances combined with soft oils. The refreshing scent of the cologne and soap is derived from an age old formula used by sailing captains, plantation owners and travelers to sooth the skin and provide refreshment. Made on the Gulf Coast of Florida. 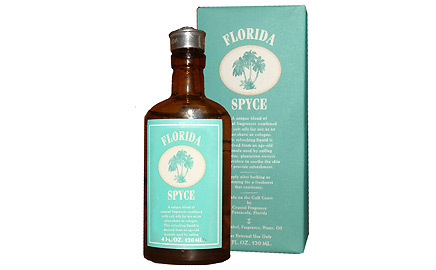 The Florida Spyce Cologne can be used as an after-shave or cologne. Apply after bathing or swimming for a freshness that continues. The amber bottle is embossed with a map of Florida and has palm trees on the pewter cap. Copyright © FloridaSpyce.com - All rights reserved.